Light Symphony can uniquely scale up from a small project as shown above, to very large schemes, simply by adding additional Lighting Control Modules. Use Any Lights - Light Symphony can operate with any lighting type, including Low Voltage, Halogen, Discharge and LED. Areas - you can switch up to 29 different areas. Zones - for larger gardens, 'Areas' can be grouped together into 'Zones' so that a single button can switch a whole section of the garden. 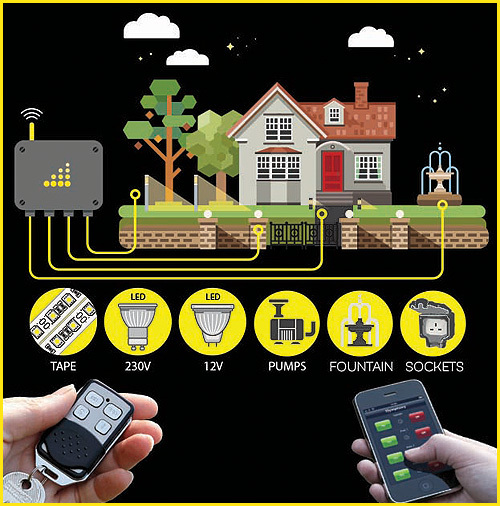 Automation - lights can be triggered from external systems such as electric gates to automatically illuminate areas as you leave or arrive (requires a Light Symphony Gate Interface or a Light Symphony Driveway Beam Sensor). Light Show - when activated it automatically controls your lighting to create a stunning performance of moving light and shadows (requires a Light Symphony Base Station). iSymphony - allows you to control your lighting system using your smartphones or tablets (requires a Light Symphony iPort Interface).